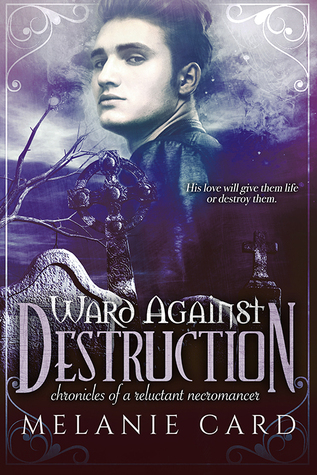 Ward de’Ath used to think that nothing could be more terrible than death. Now he realizes there are worse things. Like his never-ending hunger for blood. Even if he conquers the unbearable cravings that drive him headlong toward destruction, he’s a wanted man with a bleak future. Assassin Celia Carlyle learns she is the only one who can protect Ward from disaster. She loves him–she wants to help him, but no one can tell her how to save him from himself. And the confusing voices in her head scream to let him go. First, I feel the need to state that I haven't read any of the previous books in the series. I didn't realize at the time of receiving the digital ARC that it was book #4. That being said, here's my review based solely on Ward Against Destruction. I really like the world building Card brought to this. It made the reading experience my favorite type of immersive; the lose yourself in the politics, magics, and history type. I adore fantasy novel which really let me sink my teeth into them, and Card has done a fantastic job with this world. The relationship between Ward and Celia is absolutely my favorite mix of 'does she like me?' and 'I'll do anything to spend my life with you'! Ward's constant struggle against the 'easy' way and the right way was well crafted by Card, and I think I fell quite a bit in love with him as I read. Celia was equally well written, with a blend of uncertainty and strength that made her a dizzying character to follow. In a good way. She's someone I want to know more about. Someone I want to know their past, present, and future so I can better love her. My only complaint about Ward Against Destruction is that I know the ending of a story I haven't read the beginning for. Definitely a series I plan to add to my personal library for rereading enjoyment. -Digital ARC provided by Entangled Publishing via NetGalley, in exchange for a review. NaNoWriMo 2015 is just around the corner!! !